Home > Uncategorized	> Pottstown and Penniman and A Mystery School - SOLVED! Pottstown and Penniman and A Mystery School - SOLVED! We found Pottstown, and it isn’t the one in Pennsylvania. About a month ago, I wrote a blog about a mystery school house mentioned in the Newport News Daily Press. The story, from December 1922 said that the school would soon be built for African-American children in Pottstown, using salvaged brick from the Penniman smokestack. Problem was, no one seemed to know anything about a community called “Pottstown” near Williamsburg. Then not one, but two of my favorite researchers found a bibliographic reference in a book, mentioning Pottstown and citing a plat book at the James City County Courthouse. I toddled down to the courthouse one day (about a 50-mile drive from my home) and went into the clerk’s office and asked to see page 31 of “Plat Book Number Three.” The mystery was quickly solved. In the early 1900s, Pottstown was an African-American community in the heart of Williamsburg, and the school in question was the James City County Training School, built (finished) in 1924, and sitting at the corner of Nicholson and Botetourt Streets. After a lot of digging around, I don’t have a definitive answer, but I do have a strong suspicion. 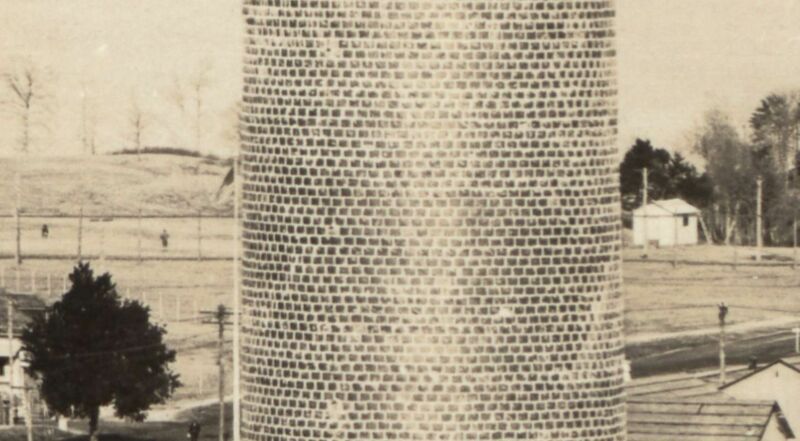 Based on the voluminous materials I’ve studied in the last three weeks, I’ve come to the conclusion that W. L. Jones probably did use those bricks from the Penniman smokestack for the James City County Training School. In short - financial reasons. 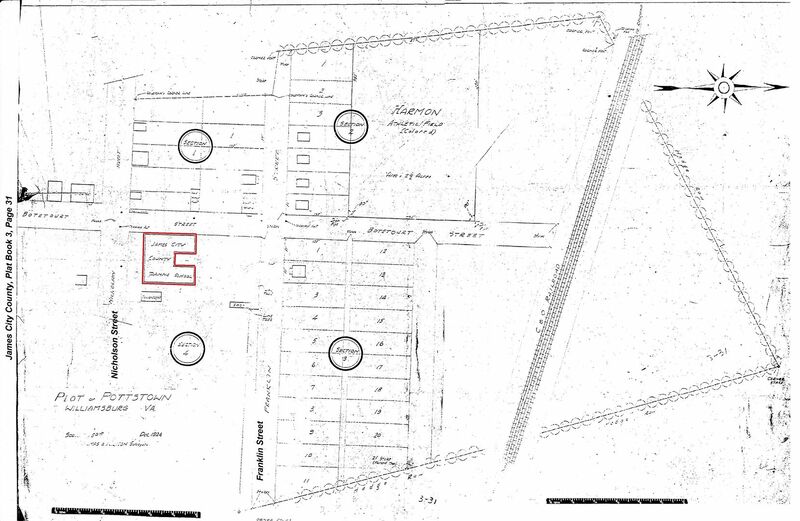 The first bids received for the James City County Training School, came in at about $30,000. The school board’s budget for building the solid-brick, six-room schoolhouse (with a center auditorium) was $13,000. Even in 1924 dollars, that was a trifling amount for a schoolhouse (about $180,000 in today’s money). There was much weeping and gnashing of teeth as school board members struggled to figure out how to reduce costs. One of the suggestions was to lop two classrooms off the plans. Ultimately, two African-American contractors (Sylvester L. Vaughan and J. Andrew Jones) stepped forward and managed to shave the bid down to $16,650. The plumbing, heating, electricity and insurance were not factored into these early bids, raising the final price to $20,280. Local black patrons raised an additional $3,700 and the Rosenwald Fund contributed $1,500. A Williamsburg contractor, R. W. Holmes, offered to supply the plumbing and heating system (and all materials) and wait one year before billing the school board. In 1924, salvaged bricks cost about $15 per thousand (clean) or $10 per thousand (not clean). In other words, if you’re willing to sit down and chisel mortar off a whole lot of bricks, you’ll save about 33% on your costs. Some ciphering shows that the school would have required about 44,000 bricks. And some extra-fancy ciphering shows that the 250-foot tall tapered Penniman smokestack contained more than 150,000 bricks (and probably closer to 300,000). 1) In July 1922, Reverend Thomas Potts had sold two lots to the school board for $1,300. 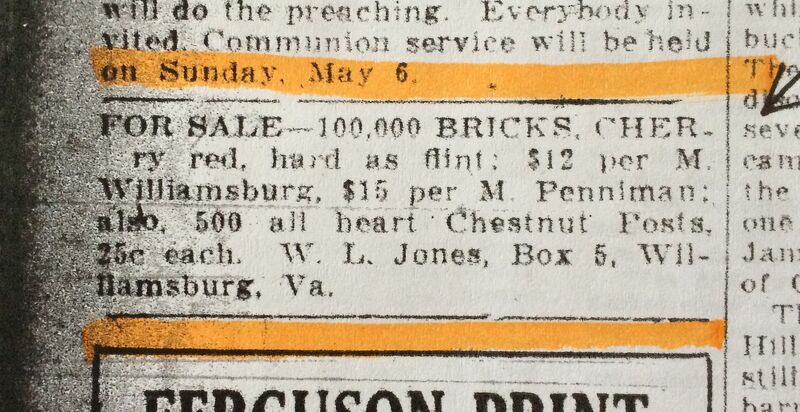 When Jones bought those bricks, a lot had already been purchased for the new school (School Board Minutes, July 1922). 2) Years earlier, Jones had given the black community a personal promise that he would build them a new brick school house. The promise was re-stated in a letter to the editor that appeared in the Daily Press in May 1923. 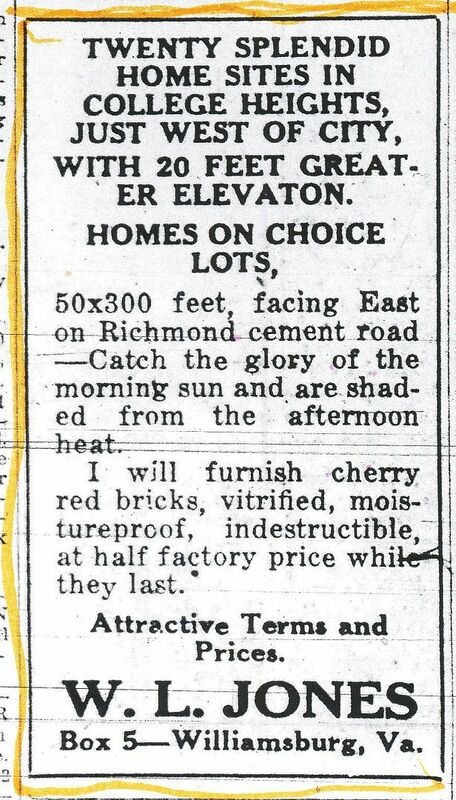 And there’s this: In the early 1900s, Americans were very thrifty and smart when it came to recycling quality building materials, and the bricks used in a DuPont smokestack would have been of the very highest quality. As of 1902, W. L. Jones had owned a brickyard in Williamsburg and he probably knew quite a bit about bricks. Buying salvaged bricks was such a common practice in the early 1920s that their prices were advertised in building journals and magazines. And salvaged bricks were considered a fine alternative to the higher cost of new bricks, as long as they were being used in a one-story structure. More on that below. Bids for the new school were solicited in May 1923, and the contract with Jones and Vaughan was closed in July 1923. On Monday, September 15, 1924, the James City County Training School welcomed almost 200 new students on its first day. Unfortunately, the James City County Training School fell into terrible disrepair in the early 1930s. The biggest problem facing the school was moisture intrusion on the interior plaster walls and non-stop leaks throughout the predominantly flat roof. Was this a failure of building materials or workmanship? Given the age of the structure, I’d have to lean toward workmanship, but it’s impossible to know for sure. Perhaps one of the main problems was that, according to the July 1935 minutes of the school board, they’d hired “Mr. Leakey” to fix the problems in the roof. That doesn’t seem like a good choice. 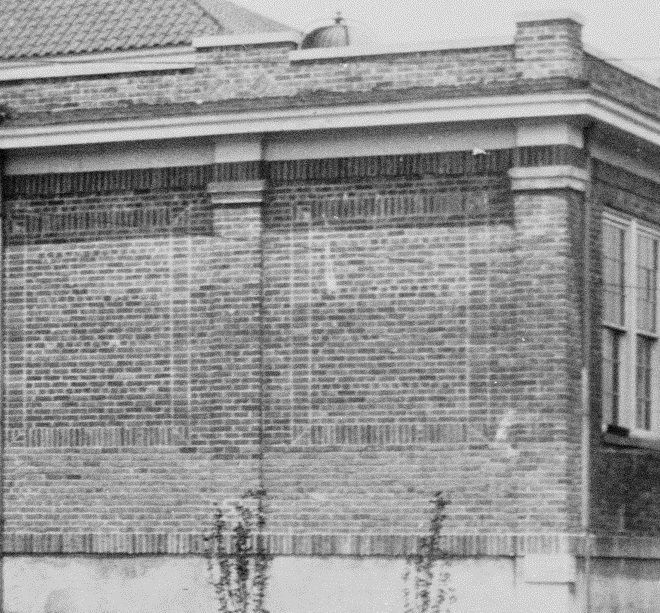 By February 1935, Rockefeller’s restoration of Colonial Williamsburg had caught up to Nicholson Street and the school board decided to stop repairing the dilapidated building. The school board officially decided that ugly was good. “Money spent [on repairs] should be spent on the inside and not on the outside, in the hope that the Restoration might buy the property if its appearance were too unsightly” (February 1935). Estimates to repair the building ranged from $8,000 to $10,000, and in early 1936, the 12-year-old school was condemned. The restoration committee stepped up to the plate and paid $10,000 for the old school building and donated a new lot for the new school (Bruton Heights). The new school would be built at a cost of $245,000 (and completed in 1940). For a time, Penniman’s bricks lived on, a little bit more. The school board minutes from June 1940 showed that gravel was being tracked into the shiny new Bruton Heights School. It was suggested that school board member, Mr. Byrd, contact the “Restoration People” and ask if the brick from the old building could be used for walkways around the new building. In August 1940, it was reported that the “bricks from the old building have been hauled over to the school grounds.” Children from the NYA (National Youth Administration) were sought to help remove all that mortar and lay the pavers in place. Additionally, bricks from the old school were used for the underpass walkway (a pedestrian tunnel under the train tracks, by the new school). Last week, as I strolled the grounds of the old Bruton Heights school, I saw only concrete walkways at every point and turn. The underpass, classic 1930s Art Deco construction, is also 100% paved in concrete. Do our Penniman bricks rest quietly under all that concrete? Thanks so much to Mark Hardin, Milton Crum, Bill Inge, Pat Spriggs, Dale Wolicki and Anne Hallerman for providing research help. And thanks to The Colonial Williamsburg Foundation for providing the vintage images of the James City County Training School. To read the prior blog on this school, click here. And I’m eager to know - did the desks come from Sears and Roebuck? 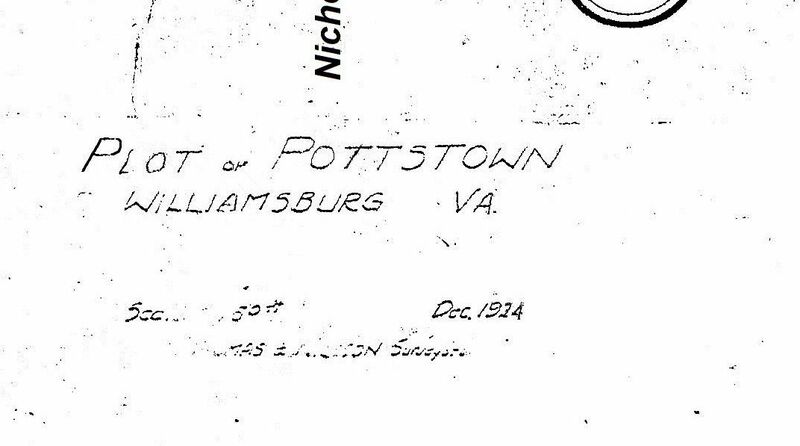 This plat from James City County Courthouse shows that "Pottstown" was a small community within Williamsburg, and James City County Training School was located at the corner of Nicholson and Botetourt Streets. Outlined in red (for emphasis) is the school in question. Harmon Athletic Field is in the upper right-hand corner of this plat. And right on the face of this plat is our answer: Pottstown. 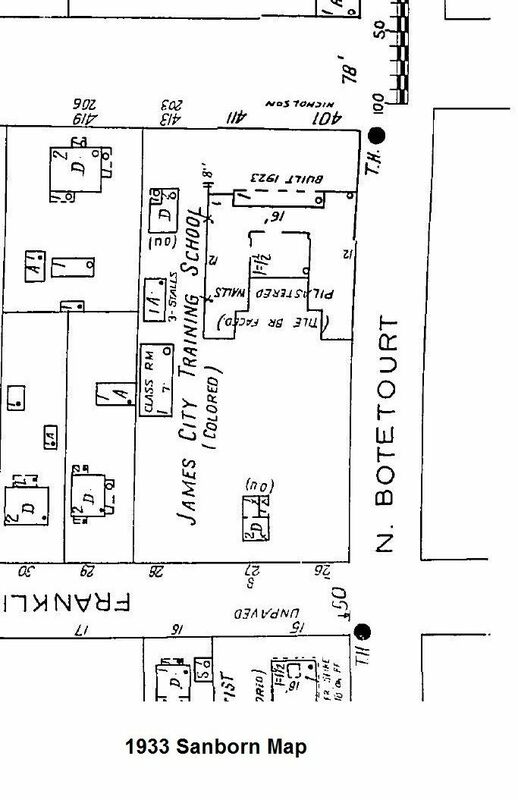 Norfolk historian Bill Inge found this 1933 Sanborn Map, which says that the JCCTS was built with hollow tile and brick. 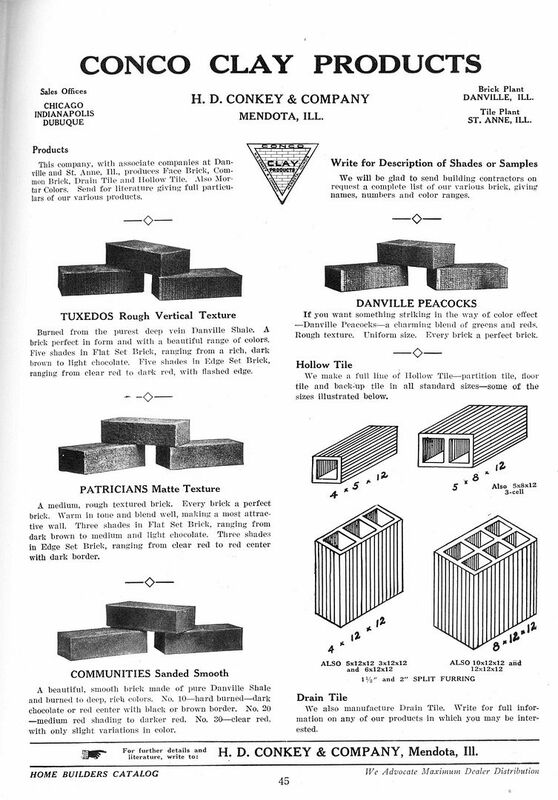 These were very common building materials in the early 1920s. Plaster could be applied to the interior face of the hollow tile, creating a fire-proof wall, and this was of utmost importance in early 20th Century America. In more expensive applications, the interior face of the hollow tile was glazed, creating a finished appearance that required no plaster. James City County Training School - on the hoof. This 250-foot-tall smokestack dominates most views of Penniman. According to the Daily Press, it took 35 sticks of dynamite to topple this behemoth. My smart friends and I are flummoxed by this view of the smokestack. Is that brick on the exterior? It looks very squarish. Is the brick turned "end out"? Based on contemporary building standards, we know that the smokestack walls were more than four feet thick on the first 20' section near the base, a little less than four feet thick at the second 20' section, and so on. That means that there's a whole lot of brick within this "tall chimney" (as they were then known). Photo is courtesy Hagley Museum and Library. Here's what started the ball rolling. 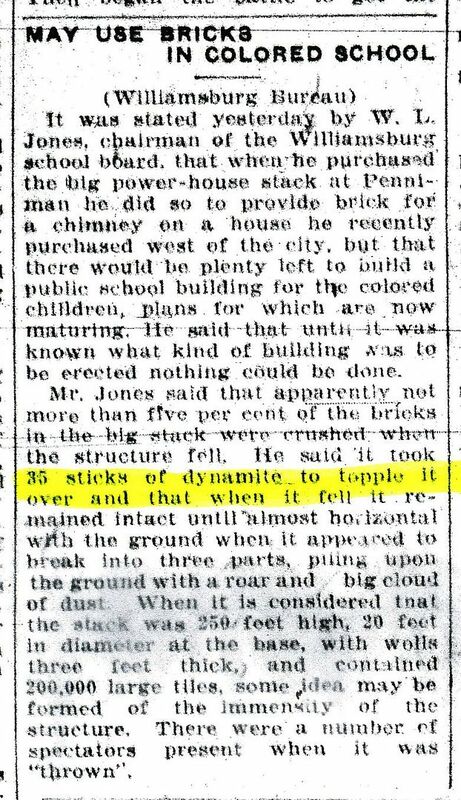 This article states that School Board Chairman W. L. Jones bought the bricks to use in the schoolhouse in Pottstown (Daily Press, December 20, 1922). And it was reaffirmed two days later (December 22, 1922). 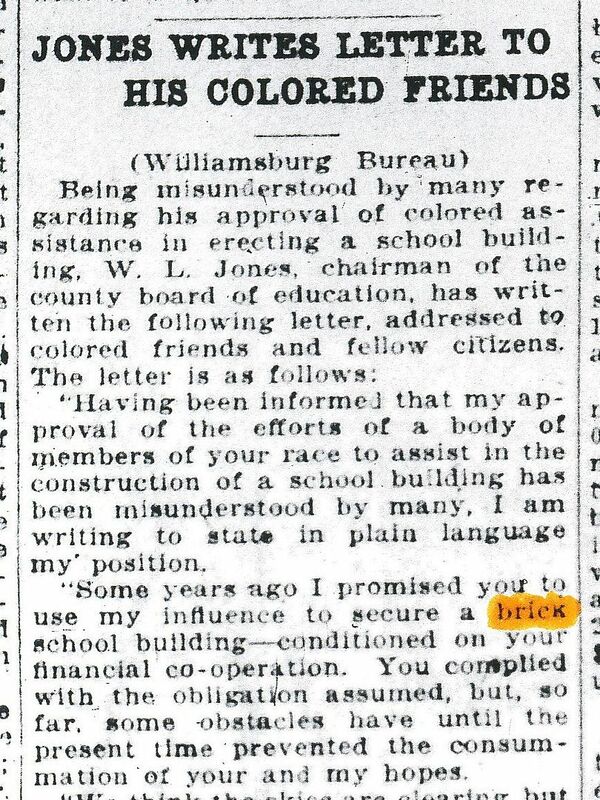 In May 1923, Jones wrote this letter to the editor of the Daily Press, re-stating his promise to build a brick school house for the African-American children of Williamsburg. And he made good on that promise. The James City County Training School is shown here, in all of its solid-brick glory. 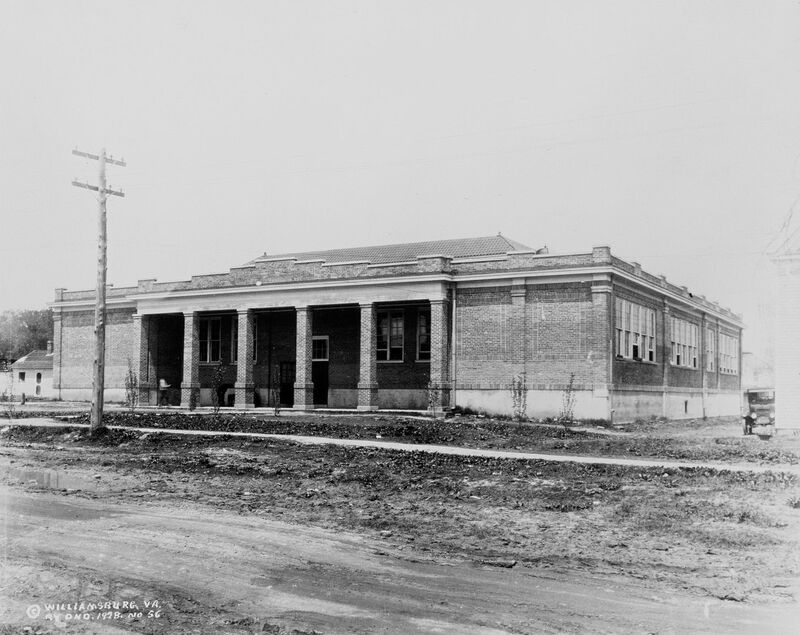 Judging from the muddy mess, it seems likely that this picture was taken soon after the school was built (1924). Photo is courtesy The Colonial Williamsburg Foundation. 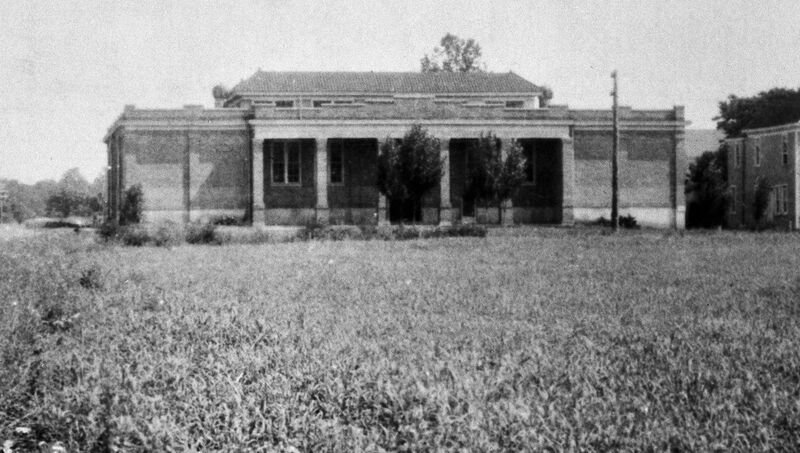 Another view of the James City County Training School. The auditorium was in the center of the building, with clerestory windows (barely visible in this photo). These windows provided an abundance of natural lighting. Photo is courtesy of The Colonial Williamsburg Foundation. Bricks and mortar bind mechanically. That bond is compromised on salvaged brick. New mortar and old bricks don't have the same strong "bond" as new brick, because the old brick's pores can be clogged from prior use. For this reason, only one-story applications would have been recommended - even in the 1920s. Today, used brick is considered suitable only for pavers and short non-structural brick walls. The image above is from the 1927 Homebuilder's Catalog. This one is a puzzler. W. L. Jones apparently had quite a few bricks on his hands. This advertisement appeared in May 1923 (Daily Press). And why are the bricks pricier at Penniman? That's another mystery. And he was offering extra-cheap bricks to people who bought his lots in College Heights. This appeared throughout March 1923 in the Daily Press. By February 1935, school board minutes reflect that the JCCTS had fallen into disrepair, and the school board hoped that the "Restoration" might buy the property. Ultimately, they were successful, and the school and lot were purchased by Rockefeller for $10,000. School board minutes from August 1940 show that the bricks from the JCCTS had been carted off to the new school, to serve as pavers. Are those our Penniman bricks? I think it's likely. NYA (National Youth Association) was a "New Deal" program. 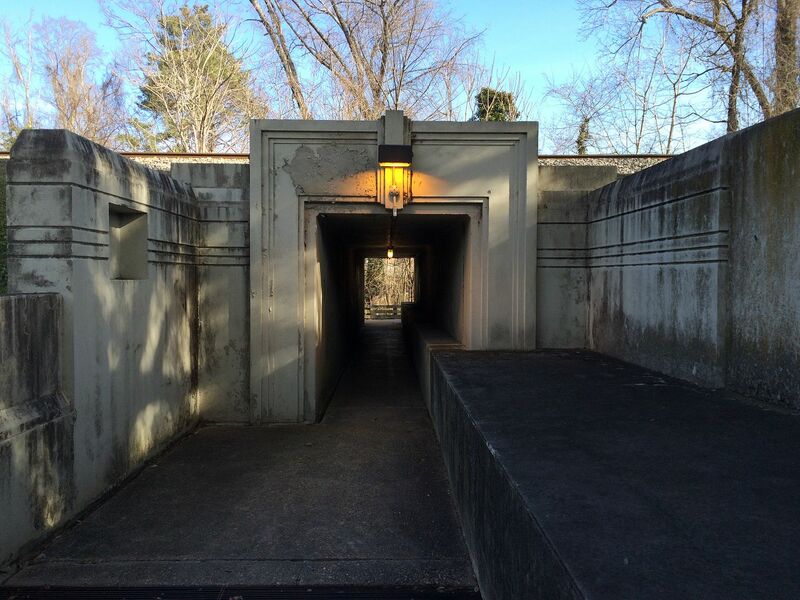 Today, every place where our Penniman bricks should appear is covered in concrete, such as this pedestrian tunnel under the train tracks (near Bruton Heights school) and the walkways around Bruton Heights. J. Andrew Jones was a professional carpenter and brick layer, and he did a beautiful job on the brick work. What a pity that it was razed a mere 16 years later. Photo is courtesy The Colonial Williamsburg Foundation. Did you see that part about The Rosenwald Foundation providing $1,500 in funding for the JCCTS? How fun is that? Wraps it all up in a neat and tidy bow, doesn't it? I spent more than three weeks of my life chasing down every detail on this story and it all comes back in full circle - Sears was involved! In 1908, Richard Warren Sears retired from the company he'd spent 22 years building, and Julius Rosenwald became president of the mail-order business, and also became a very wealthy man and a philanthropist. Catalog shown above is from 1926. 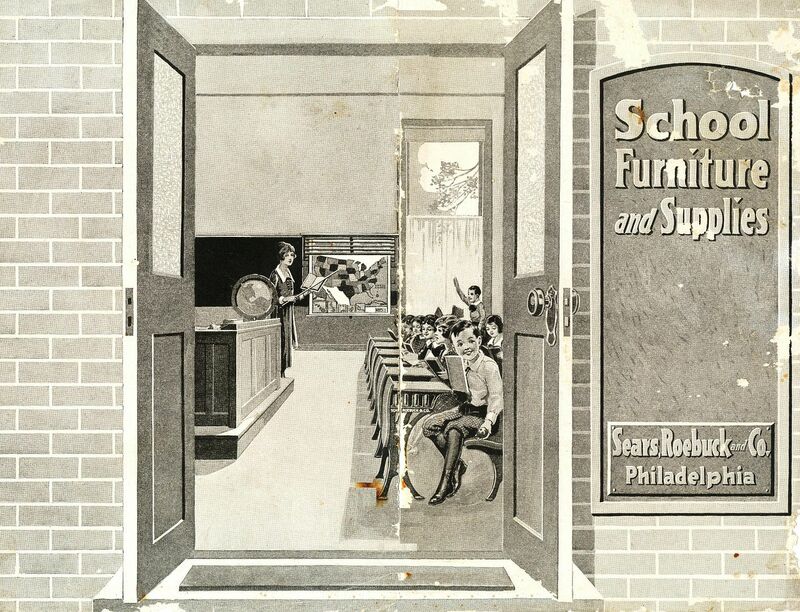 Did you know Sears sold school desks too? What a great and interesting write-up! It is amazing how much you can piece together through old articles, meeting minutes, etc. for an event almost 100 years ago. Nicely done! Wow ! Outstanding research !!! I loved your writing and the layout of the story with the photos !!! It’s a damm shame the school was razed. This beautiful brick laying skill is a lost artistry. The recycling of these beautiful chimney bricks and the stories around their unique history is remarkable. You know this story would be of interest to former Gov. Doug Wilder and his work for preserving Black History and the historical contributions made supporting the education of African Americans in Virginia. You should consider sharing this story as a historical contribution towards Gov. Wilder’s museum in Richmond. I’m certain the curator would be interested and appreciate your dedication and hard work for following thru with solving this mystery. I think those “colored”children who were educated in the first school ever of it’s kind and all those working together who made a dream come true deserve this part of history to be seen and heard for future generations.